This post is in response to questions about Cover 1 asked in the comments of the Cover 1 (Man Free) Technique post. #1. How do the SS and WS react when both #2’s go underneath immediately? Both safeties make a cut call. The LB’s have a fiddle on the running back. The RB releases to the Mike so the Mike takes him in man coverage. The hole dropping linebacker (here the Will) cuts any route crossing his face. In this case there are two crossing routes. The Will cuts the first route he sees. In this example he cuts the crosser coming from the right (red). Both the SS and WS are going to start working to the Hole. A hole dropper’s rule is to cut any route crossing their face. The WS will see the uncovered crosser from the left (blue) crossing his face and will cut the route. 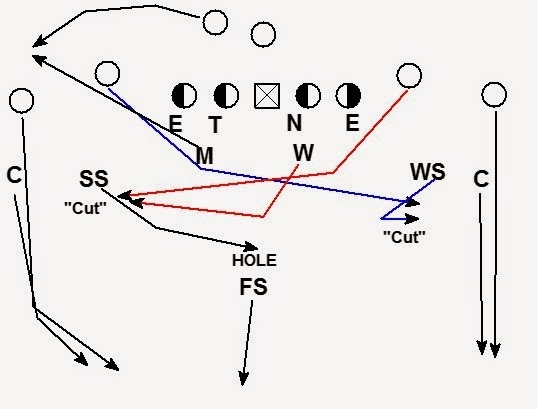 The SS will see the LB covering the crosser (red) and will continue to the hole. If the Will cuts the blue crosser the SS and WS will switch reactions. #2. What will it look like if the #2 runs a crosser, #2 runs a dig, and the back releases to the Dig? Can a LB cut a crosser from his own side? Yes, a LB can cut a crosser from his own side. 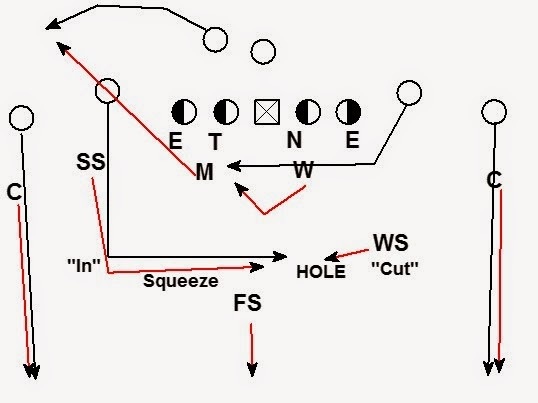 Here the fiddle LB to the RB (Mike) takes him in man to man cover. The LB away from the back (Will) become the hole player and cuts the crosser. The WS makes a cut call and works to the hole. The SS makes and “In” call and squeezes the dig to the WS in the hole.